Home > Law Books > Treatises > Cuba: A Legal Guide to Business, 2016 ed. Cuba: A Legal Guide to Business, 2016 ed. 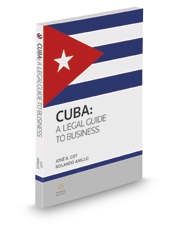 Cuba: A Legal Guide to Business comes at a time of renewed interest in the Cuban market. Cuba has implemented market-oriented economic reforms and there's been a shift in U.S. policy towards Cuba, culminating in the restoration of diplomatic relations between the two nations. In addition, in March of 2014, Cuba adopted a new Foreign Investment Law designed to attract foreign capital. The Cuban government has also issued a list of over 200 projects that are candidates for foreign investment in such sectors as energy, tourism, agriculture, and industry. While the U.S. Embargo remains in place, a majority of Americans support the Obama Administration's policy of engagement and normalization of relations with Cuba. The Obama Administration introduced changes to the Cuban Assets Control Regulations, reopened the U.S. Embassy in Havana, and rescinded Cuba's designation as a state sponsor of terrorism. The new policy changes have led to a considerable increase in travel and remittances, commerce, and the flow of information to and from Cuba. It is with this backdrop that this title provides important and practical guidance on how to successfully navigate the current legal system to help clients and businesses explore commercial transactions in the Cuban market.